Leslie Stephen (1832-1904) was a writer, philosopher and literary critic whose work was published widely in the nineteenth century. As a young man Stephen was ordained deacon, but he later became agnostic and much of his work reflects his interest in challenging popular religion. This two-volume work, first published in 1876, is no exception: it focuses on the eighteenth-century deist controversy and its effects, as well as the reactions to what Stephen saw as a revolution in thought. Comprehensive and full of detailed analysis, this is an important work in the history of ideas. 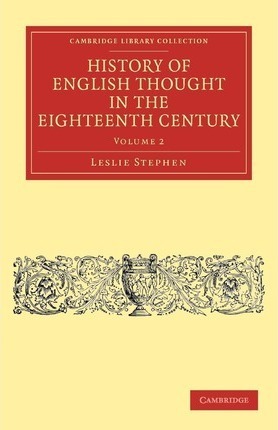 Volume 2 focuses on eighteenth-century moral philosophy, political philosophy and literature, and on the literary and religious reactions to the revolution in thought. Utilitarianism is discussed at length, as well as the work of thinkers such as Shaftesbury, Mandeville, Burke and Adam Smith. 9. Moral philosophy; 10. Political theories; 11. Political economy; 12. Characteristics; Index.